I've received a few quotes and the products are all over the map. How do I determine which are the best products? If I want to purchase a combi heat and water, does a Weil-McLain (GV90+) offer water? How does it compare with IBC wall hung high efficiency unit? One is rated at 95 the other at 92. In reality, how much savings will I see between the two? Also any advice on my purchasing the unit vs the contractor. It seems contractors like to add a hefty upcharge. It is a nice gig if you can get it but I'm not too keen on paying significantly more for the same unit. If I can find a contractor to install a unit I buy (unsure about this), what certification should I look for to make certain the installer can actually install a gas boiler meeting all quality standards? Finally, any propane boiler brands I should focus on - or avoid? The Weil-Mclain GV 90 is not a combi unit. You would need an indirect with it. Excellent choice in my opinion. The IBC is a good choice if your looking for a wall hung combi unit. Make sure you have adequate baseboard and or radiant heat to get the maximum benefit from it. As far as purchasing a unit, I would not install a unit purchased by another. To many headaches come with it. First of all the contractor you choose is the MOST important part of the decision. No legitimate contractor can stay in business installing boilers bought by the consumer....bad idea...and most legitimate contractors will not do it. Contractors can't stay in business just getting paid for labor. I am sure you can find a handyman....a buddy...or someone to install it and you will absolutely end up with a job that wont ever work right. Doing this work isn't rocket science but it is all about attention to detail. The pages of this site are littered with homeowners who unknowingly did the wrong thing unintentionally. @Dunk , I see you falling into this trap. The contractor is more important than the boiler. 92-94-95% means nothing when the job is wrong. You can drive a Mercedes or a Chevy. Not to many Mercedes mechanics but most could fix a Chevy....then their are the parts cost.. But that's just my opinion. Much appreciated feedback. For a 1900-2000 sq foot home, what size Weil-McLain unit makes sense? We live in Vermont. How might I calculate the annual cost savings between my current AO Smith (23 yrs old) which is probably 80ish efficiency vs a W-M GV90+ or IBC H Series? We have a on-demand Takagi wall unit that supplies our hot water. It’s about 6 yrs old. Any idea the longevity of these units? I should add we have one radiant zone that runs off of the Takagi unit (140 sq ft) that also provides our home hot water. Three other zones: one that is 400 sq ft, the other two zones are 1000 sq ft. The main living zone has a Nest thermostat. Any concerns using the Nest with a Weil-McLain GV90+ or IBC HC Series. One contractor likes Rinnai. Thoughts? What is the recommended cleaning interval for the above? Is a more conventional W-M less costly in maintenance? The amount of radiation you have IMO should be a factor in deciding between models of various efficiencies. Takegi vs Rinnai for wall hung propane boiler? I’m getting different recommendations. IBC has been recommended too. Takagi is only used for hot water? 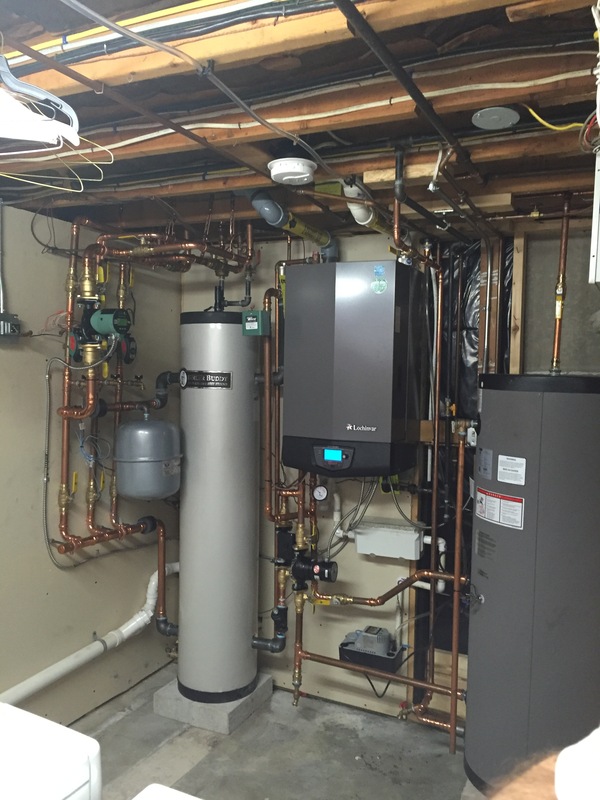 Does Rinnai offer a combi sufficient for a 2000 sq ft home with 2 full baths? Or, am I better to use an IBC HC Series? Primary heat exchanger utilizes HRS35 commercial-grade copper alloy “for 25 times better heat transfer than stainless steel” - is this true? I’ve received three quotes for IBC and one for a Takagi. Regarding these manufacturers, any recommendations?